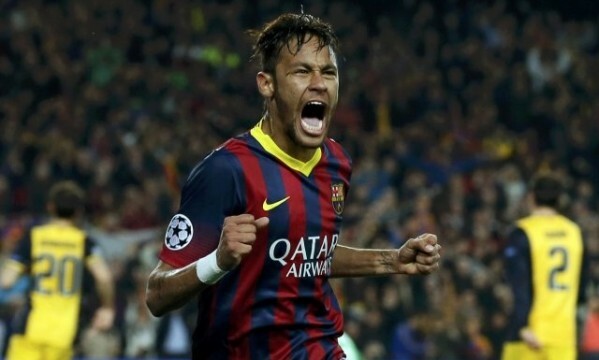 Barcelona 1-1 Atletico Madrid: Neymar keeps the hope alive! You Are Here: Home » Neymar news: 2018-19 » Barcelona 1-1 Atletico Madrid: Neymar keeps the hope alive! 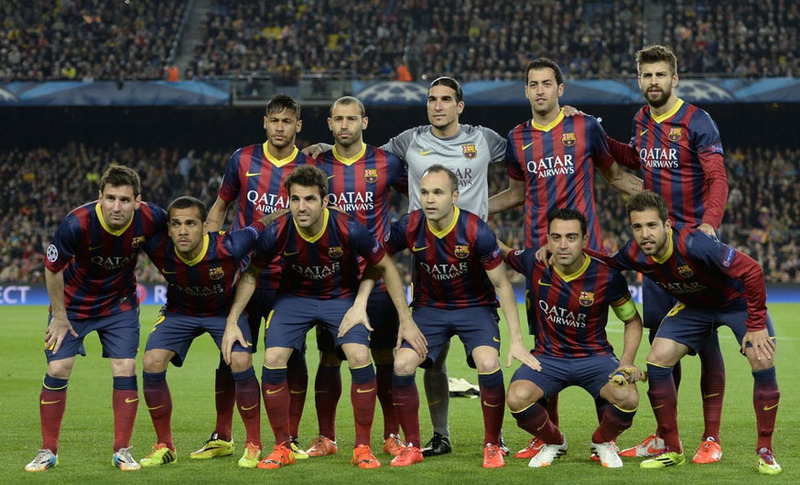 Barcelona line-up: Pinto, Jordi Alba, Mascherano, Piqué, Daniel Alves, Busquets, Xavi, Iniesta, Fabregas, Neymar, Lionel Messi. The fourth meeting between these two teams this season ended up with another enigmatic draw. In roughly 360 minutes of football between Barcelona and Atletico Madrid, neither of the sides has yet edged the other in a convincing way. This Tuesday night, the UEFA Champions League quarter-finals first leg were played at the Camp Nou and the final result was another 1-1. The goals were scored by Diego Ribas for Atletico and Neymar for Barça. The first-half was marked by two unfortunate events that resulted in injuries for important players from both sides. First it was Gerard Piqué, who had to give his place to the young Bartra, and later in the half Diego Costa also aggravated his muscle injury and had to come off the pitch. His replacement was Diego Ribas da Cunha, who would turn out to be have a critical role in this game’s outcome. We were still inside the first quarter of an hour in the second half when Atletico Madrid drew the first blood in the Camp Nou. The goal was quite simply the consequence of an inspired moment from Diego Ribas, who tried his luck from near one of the edge of Barcelona‘s box and sent the ball straight into one of the top corners. Some will certainly blame Pinto for his poor positioning in the goal, but the truth that the unpredictability on Diego‘s move and long-range effort made all the difference and no credit shouldn’t be taken off this Brazil international midfielder. 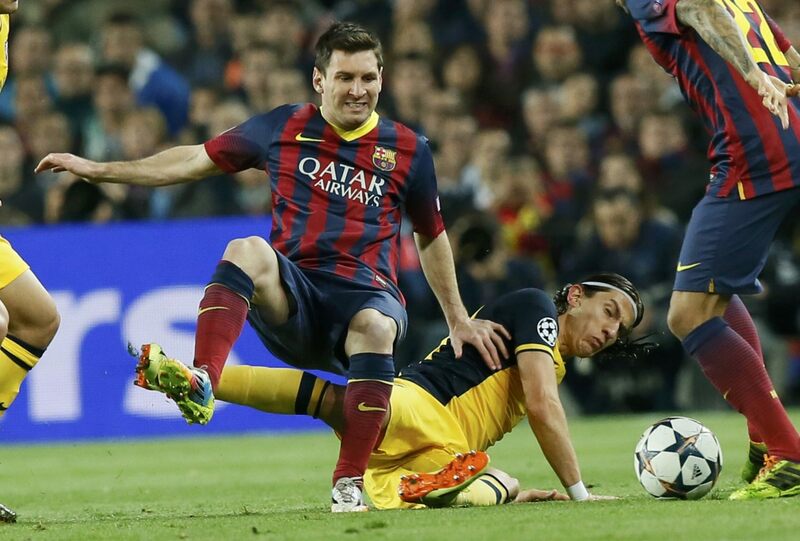 Barça was in trouble and conceding at home in such a predictable tight quarter-finals has definitely been a big blow. Gerardo Martino‘s men reacted well though and led by Xavi, Messi, Neymar and an outstanding Iniesta, they would get the equalizer in the 71st minute. It would be precisely Iniesta finding the gap in Atletico Madrid‘s defense and setting up Neymar for a golden chance to try to beat the enormous Courtois. The Belgium goalkeeper, who is still under contract with Chelsea, couldn’t reach to Neymar‘s ball and Barça had finally got to the deal they had been chasing for so long. The game ended with the 1-1 on the scoreboard, but with Barça pressing hard and pushing Atletico Madrid back into their own half. The second-leg will surely deliver us another exciting game and it might very well end up going into penalty-kicks shootout if neither of the teams manage to outdone the other. As for the other game of the night, Manchester United held Bayern Munich to a 1-1 draw at Olf Trafford and tomorrow we’ll have another 2 big games taking place, with a Real Madrid vs Borussia Dortmund at the Santiago Bernabéu and a PSG vs Chelsea at the “Parc des Princes” stadium, in Paris.